Waste management company Republic Services has taken creativity and resourcefulness to a whole other level, installing 10 acres of solar panels on a closed landfill in Georgia, and the project is now producing close to one megawatt of power. The 88-acre Hickory Ridge landfill near Atlanta, Georgia, was filled to capacity. Having lived out its useful life as a safe disposal facility, the gates were closed, and site staff began preparing for post-closure and the 30 years of environmental monitoring required by federal regulations. Normally a synthetic cover would be placed over the waste, followed by soil and grass, keeping liquids out and gases contained, returning the hill to something resembling the surrounding landscape. But waste handler Republic Services proposed another option, one that meant continued usefulness—as a generator of renewable energy. "We did a pilot project in 2009 at our Tessman Road Landfill in San Antonio, Texas. That was about an acre, and we learned a lot," says David Stuart, area environmental manager for Republic Services. Republic's Brian Martz and Tony Walker wanted to use the same flexible laminate-type photovoltaic (PV) solar collection strips developed by Uni-Solar for the Georgia landfill. 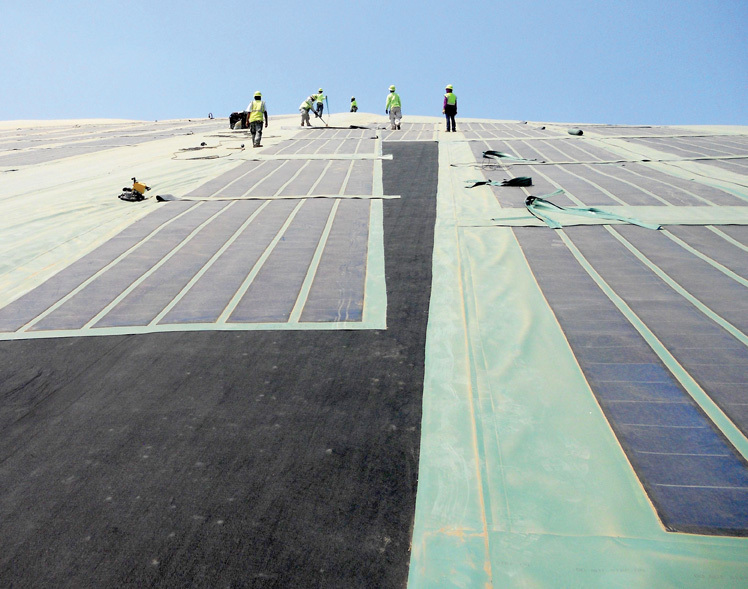 The strips are attached directly to the synthetic geomembrane used to cover and close a landfill. With a successful pilot under their belt, the team set out to put an even bigger project on the ground. With a combination of company investment and a $2 million award from Georgia Environmental Finance Authority (GEFA), the project encompasses ten acres and generates one megawatt of power (double what Republic would have been able to do on its own). The state approved the switch from the more traditional closure method to an exposed geomembrane with affixed solar panels. "We needed to put on a 45-acre closure cap to finish the closure," says Stuart. "GEFA assisted with some funds, allowing us to go from a 5-acre installation to a 10-acre installation, covering the entire south side of the landfill." One of the biggest challenges with landfill closure designs is the instability of the surface due to settlement over time. "By their very nature, landfills change over time as materials decompose and require less space," says Stuart. The flexible liner and flexible solar panels ensure that the integrity of the system remains intact over time. At the Texas location, the team secured the flexible panels using special glue on the surface of the exposed geomembrane. This system was complicated by dust, variation in temperature, moisture, and other environmental changes, which made it difficult to get a good seal between the panels and the liner. One of the biggest challenges with landfill closure designs is the instability of the surface due to settlement over time. Landfills change over time as materials decompose and require less space. On the Hickory Ridge landfill project (above) the flexible liner and flexible solar panels ensure that the integrity of the system remains intact over time. 36 solar panels and has a life span of 25 years. 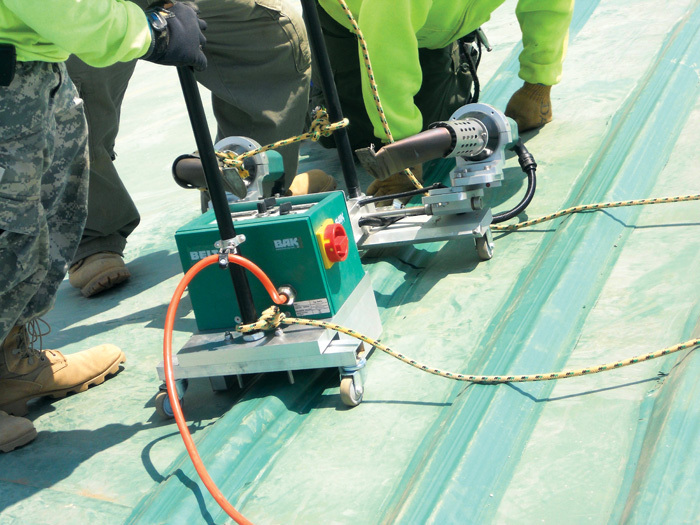 The Power Mats may be flexible, but they aren't as efficient as standard solar panels. Each mat generates about 5.2 kilowatts. "We have 6,984 flexible solar panels in our project," says Stuart. "With that kind of solar power, we're able to generate about one megawatt of power from the Hickory Ridge site, which is about enough to power 224 homes." Georgia Power has an agreement to purchase that 1 megawatt at avoided cost and is currently building a power station at the Republic facility. Republic quickly discovered that the Power Mats didn't just generate power, they also helped create cleaner storm water. "We get about 40 to 50 inches of rainfall a year in Georgia, and we have a lot of silty, sandy clay," explains Stuart. "A lot of times, if it's raining, you'll see rivers and creeks looking muddy. The runoff from the panels is so clean that our storm water management pond has improved." With maintenance and monitoring mandatory at closed landfill sites for three decades, Republic says maintenance for the solar panels trumps upkeep of soils and grass. "Solar has lower long-term maintenance costs," says Stuart. "You don't have to mow it every quarter or repair washouts. There are so many things that you don't have to do whenever you get away from dirt." Maintaining the solar panels requires someone to walk the surface, checking for any kind of delaminating. "We also look for things like settlement that may have caused a low spot that's holding water in the landfill. Or possibly a trapped gas bubble," says Stuart. The real economic benefit of solar landfill covers comes from the diverted or avoided costs of closure expenses. Republic is evaluating the possibility of applying solar covers on other landfills slated for closure. The solar energy cover was installed in relatively short order. The project, which included capping the entire 45 acres with geomembrane and 10 of those acres with solar, took just 11 months. "Each of our landfills is evaluated individually as a candidate," says Stuart. "It won't be right for every location, but we have certainly seen the benefits at the sites where we have already installed this technology." "Now we're looking in locations where we feel the regulators would be open to considering it. That's really a huge driver for it—the state agencies that regulate landfills must be on board and approve of this now tested technology." He added, "State regulators want to keep gas in and water out of the landfill. They also want these sites to be aesthetically pleasing. This technology meets all of those criteria." In 2010, Republic Services sold the solar energy cover technology to Carlisle Energy for further development and now works with the group on refining the technology and installing it on approved sites. Looking at future installations, Carlisle is continuing to improve not only the flexible solar panels but the installation technology as well. The lessons learned at Hickory Ridge—the first large-scale installation in the United States—will make future projects more efficient and thereby more financially feasible. 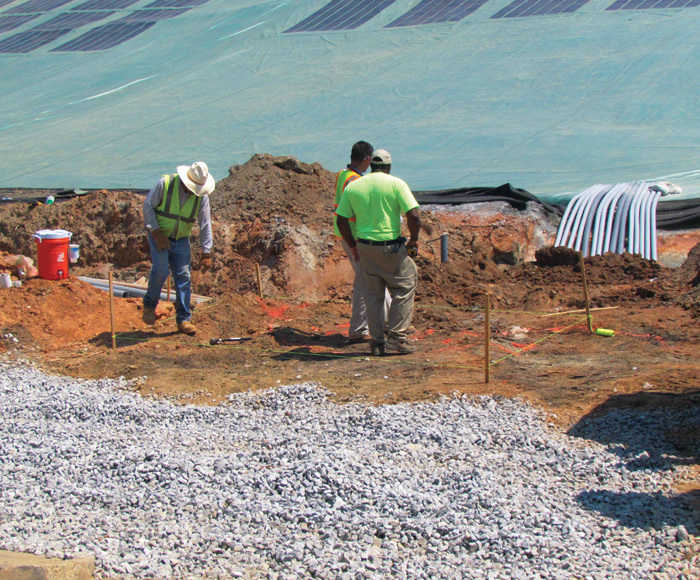 To prepare for the installation, an earthwork contractor and crew smoothed the ground and prepared the surface to accept the synthetic cover. Installation included anchor trenches spaced about every 70 feet to hold the geomembrane in place. A 14-person installation crew drove the liner up to the area, unrolled it, and put it in place. From there, the crew included workers to weld the separate pieces together and others to observe, document, and test what was done to make sure it conformed to engineering standards. They measured strength, durability, and resistance to stress. Finally, an electrical crew wired it all up. In all, the solar energy cover was installed in relatively short order. The project, which included capping the entire 45 acres with geomembrane and 10 of those acres with solar, took just 11 months. That included downtime for winter snowstorms and freezing conditions as well as for strong winds. For Stuart, the highlight of the project was being involved in something relevant to the future of the landfill business. "To me, this is a better fit than just growing grass. To make a dormant resource productive—a resource we are already taking care of for the next 30 years." The project is also something the state should be proud of. "It's very forward-thinking from Georgia's standpoint. Sometimes states bear some scrutiny when they go outside the box. But in this case, it was just the right time, the right match," said Stuart. In the end, it's easy to see why refuse-to-renewable-energy is the way to go, he added.